The victims’ families of the Kuluhun deadly police shooting consider the incident was planned beforehand. Two police officers were suspected of releasing deadly gunshots to break up a quarrel between several young men in a party in Kuluhun this weekend leaving three people dead on the spot and five others injured. In a press conference held in Kuluhun, Dili, on Monday, the Spokesperson of the victims, Georgina Da Silva said it was not an accident; the incident had been planned before. “Two young men were argued during the party and there was already an old man named Joanico Batista Carvalho there who had talked to these two young men, then suddenly there were gunshots, the police officer with initial PQ (the party host, red) and JM, PQ’s colleague, were the ones that opened the fire. These two police officers had been seen threatening young people in the area, details will be revealed in court trial by eyewitness,” she said. She added these police officers were not on duty because they were at the party in civilians’ clothes, but carried guns, therefore, government and police command’s decision to allow police officers to carry their weapons home was regrettable and unacceptable. She called on the government and police command to take care of the deceased victims’ wives and children including injured victims in the incident. Meanwhile, President of the Republic, Francisco Guterres Lu-Olo condemned the fatal police shooting, saying the case should be investigated thoroughly and the suspects should be taken to court to hold them accountable. “The incident has made us sad. 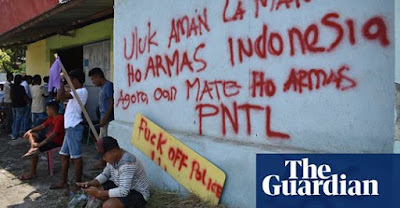 But I can say these police officers have acted outside of the law, they were not on duty and went to a party carrying weapons and shot people, therefore, it should be taken to court to hold them accountable,” Lu-Olo told reporters in Cathedral Dili on Monday (19/11).